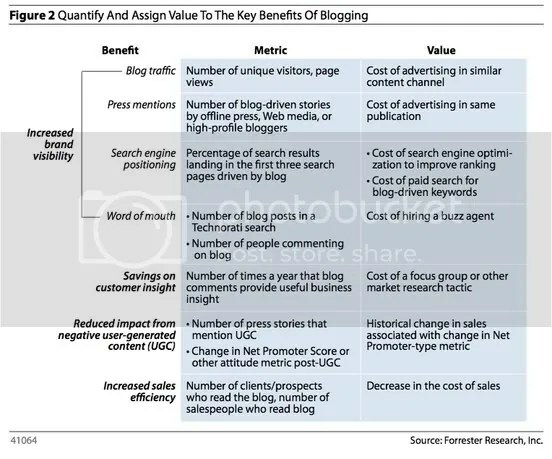 Blogging ROI: what’s easy; what’s not? As you can see, this process and framework is not cut and dry, black and white. Rather, it’s highly subjective, requires tremendous judgment, and is open to interpretation. But it is a starting point for an otherwise nebulous activity. (a) Savings on customer insight – this is not exactly impossible but may prove to be more time-consuming & nebulous than imagined; measuring the no. of times blog comments provide useful business insight. (b) Blog traffic – what are similar content channels to blogging? is it advertising through RSS feeds? (c) Increased sales efficiency – I believe an increased number of clients and prospects reading your blog will inevitably lead to increased sales but I’d love to read the Forrester Report to figure out how they measure that. Do you have a better idea of how it’s done? It’s ironic how new media’s true worth is calculated on the basis of the old media it finds placement within! It is good to read how you have been wrestling with this question. We are still caught between two worlds; the old world of broadcast and monologues, and the new world of narrowcast and dialogues. Thanks for stirring my thoughts on a cold Iowa day. Thanks, Michael, for your observation. Media is still evolving and I’m glad we get a chance to influence thought. Very sweet irony, indeed. But that’s nonetheless the way the world is still ordered. Anyway, that’s what Time Magazine said. Some things never change. It always boils down to numbers, numbers, numbers. The sad thing is that many of the newer formats, such as blogs or forums, always have to fight the battle internally to get them on. And, I’d still like to think so. It looks like the blogging format is being adopted by traditional media en masse (just see TIME’s new format) and is seeing the greatest viewership within these versions of traditional media. And, THAT is because of the positive impression our blogs have had in the minds of readers. I agree with ya there. At the same time, a CEO is always going to look for the “real number”. I think Charlene actually put together a nice list of the tangibles from community interaction…. I’d agree — Charlene’s paper is the necessary step in the evolution of corporate blogging. I’m sure corporate blog evangelists have more ammo to help them convince their teams of the necessity of corporate blogging. I also enjoyed your trialogue w/ J and Charlene on engagement. Nice stuff, Damon!